Even before I turned the big one and the year after and many years before, birthday celebrations have been about cake and getting others to donate to my favorite cause. I was delighted to see Amy Sample Wards's Facebook Cause for several reasons. She is supporting Free Geek (I had already sent in a contribution, but decided to give again in honor of Amy's birthday!). The Birthday Cause feature is new. 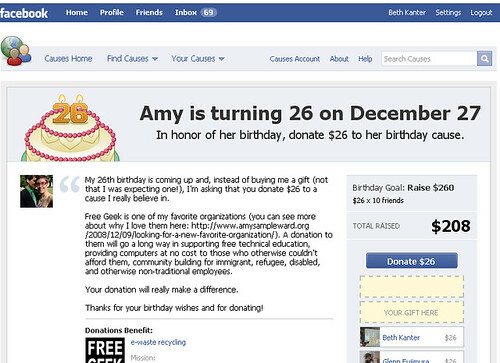 Users get an message from Causes two weeks before their birthday encouraging them to set up a cause for their birthday. I'm definitely going to play with this for my birthday on January 11th. What was also a delightful surprise was that when I made the donation, I discovered that there was a check option to allow Causes to provide my contact information to FreeGeek. Update: This feature is new to me, but probably has been there for a while. It's been about six to nine months since I made donation to a nonprofit via a Cause. In your administrative or partner account, you log in to your nonprofit dash board and under the donations tab download a .csv file. You still don't get the email address though. Thanks, Beth! I think the system Causes has set up for the Birthday Cause process is really something great. 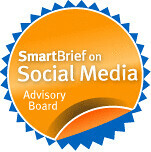 The feedback I get via email is really helpful if people need that in-their-face pull to stay involved, the click through steps for all kinds of publicity to your network is so simple and straightforward, and the donation options for donors (like you highlight) really make it a winning process for the benefit organizations. After it's over I'm going to write up a big post about it and will let you know! Thanks again for your support and donating! I checked in with Marie and they send an email with the donor information to the administrator. Not clear if you can export the information or not. Will look forward to your blog post -- I have another birthday coming up in January! Maybe this year will celebrate on Causes.